Home » What On Earth Was This Mysterious Light In The Sky Above The West Coast Last Night? Last night a mysterious light lit up the skies over California, leaving people as far east as Louisiana perplexed. What was that weird blue glow in the sky? 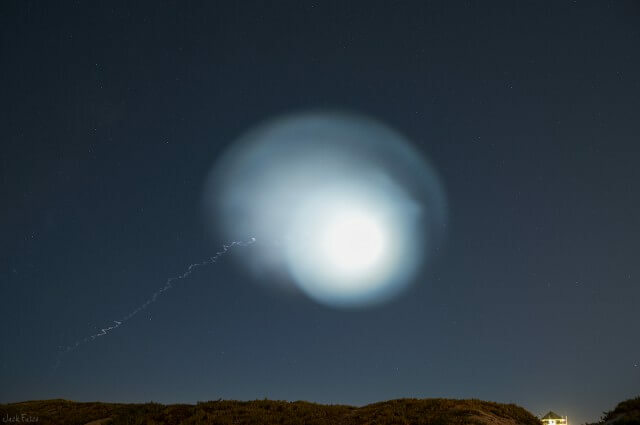 Naturally, there was some speculation that perhaps the light was a UFO or even a meteor – but in reality it was the launch of a Trident II (D5) missile by the U.S. Navy. The unarmed missile launched from the Kentucky, an Ohio-class ballistic missile submarine that sits off the coast of Southern California in the Pacific Test Range. The test was pre-planned although not announced or confirmed until a few hours after the launch. These types of launches are routine, although rarely announced ahead of time, and help ensure the reliability of Naval systems. The Navy frequently uses a test range just northwest of Los Angeles to test fire standard cruise and Tomahawk missiles from submarines and other ships. The airspace over the test range has been activated and all nighttime flights to and from Los Angeles International Airport have been diverted away from that area for the coming week. Neither the military nor the FAA have disclosed what activities will be taking place near the country’s second-busiest airport over the next six nights. Since the launch occurred at sunset, it made for a spectacular show. The missile’s exhaust reflected sunlight as it soared through the sky, producing a stunning view. You may remember earlier this year when an Atlas V launched from Florida’s Cape Canaveral and produced similar striking views. An expanding halo can be seen in most of the pictures and that is most likely due to a staging event. The missile has three stages and as one is shut down and ejected, the next stage ignites via a small explosion known as an ordnance. If the staging event occurred when the missile was high enough in the atmosphere, it would produce a bright flash and a halo of gas. Who knows what else we may witness over the next week as the test range remains active.